Ex-Kenyan president Daniel arap Moi has denied any involvement in the infamous Goldenberg affair - the country's biggest financial scandal. Kenya lost up to $600m to a company involved in fictitious exports of gold and diamonds between 1990 and 1993. Mr Moi told the BBC he would never have allowed such a thing to happen. Recently two civil servants told a commission investigating the scandal that he had ordered payments worth $76m to Goldenberg International. 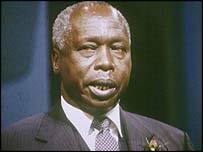 "It is only an insane person who would have allowed millions of dollars to be moved verbally," Mr Moi said. The man, who rarely allowed detailed questioning by reporters during his 24 years at Kenya's helm, was speaking at his Nairobi home after launching his charitable organisation, The Moi Africa Institute. Investigations into Goldenberg International began a year ago. The Goldenberg scandal cost Kenya the equivalent of more than 10% of the country's annual GDP. Kenya has negligible amounts of gold or diamonds. Several of the players involved, including Goldenberg owner Kamlesh Pattni and several government officials, have been prosecuted but never convicted.